RF Hardware: SoftRock40. The software is pertty useless without the front-end hardware. Operating system: Windows ME, Windows 2000, or Windows XP. Rocky may or may not work on Win98SE. It does NOT work on Win95 and Win98GE. CPU: P-4 1GHz or higher is recommended. I tested the program on a P4 3GHz system and on Athlon 600 MHz. It worked on both, but the CPU load was about 40% on Athlon at the 48 KHz sampling rate. 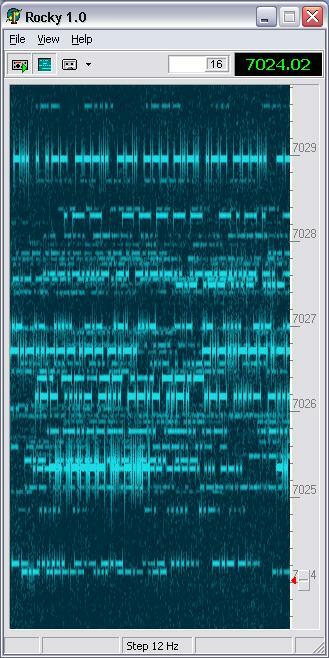 On the Pentium, the CPU load was 7% at 48 KHz and 10% at 96 KHz. Sound Card: Delta-44 is what I currently use. My on-board SoundMAX also works with Rocky, but it does not support the 96 KHz sampling rate and generates a lot more noise than Delta. Download the Rocky setup package and run the installation. Start Rocky and click on View / Settings in the menu. Select the input and output devices, and specify the sampling rate. If you have two sound cards, select different cards for input and output. This will allow Rocky to open the output card at a lower sampling rate and thus save some CPU cycles. Click on the DSP tab and enter the exact frequency of the LO in your SoftRock. Click on the Start Radio button. Use the Windows volume control to set the desired volume. You have to do this only once, the AGC will take care of the rest. Read the section below to learn the basic commands. Ctrl-Click in the spectrum or waterfall display to tune at the frequency under the mouse cursor. Ctrl-Right/Ctrl-Left and Ctrl-Up/Ctrl-Down - jump to the next/previous signal. Drag the corner of the window to resize the display. Home/End or drag the filter box - change the filter bandwidth. Waterfall display enhancements: key-click filter and super resolution mode. S-meter added. To calibrate the S-meter, tune at a signal of known strength, then Ctrl-drag the marker on the meter to the place where it should be. SSB mode implemented. The upper and lower cutoff frequencies of the SSB filter are independently adjustable. Multi-band support. The drop-down button to the right of the frequency display allows you to select one of the pre-defined bands. 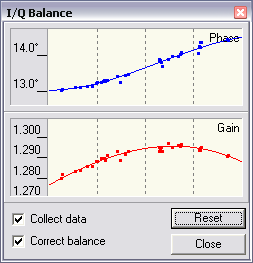 For each band, the LO frequency and I/Q balance info are stored. Run the program once, then open Rocky.ini in a text editor and add/delete/edit the band definitions if necessary. WAV file recording/playback. You can record either the input I/Q signals or the output audio signal. The I/Q recording can be played back in Rocky. The recordings of the output signal can be played in MS Multimedia Player. Please enter your name, callsign and QTH in the Settings dialog. Rocky will put these data in the comments section of your wav recordings so that other users will see at a glance when and where the recording was made, who made it, and what the LO frequency was. When playing an I/Q wave recording, you can view this info by moving your mouse cursor over the playback progress bar. Rocky talks directly to the WDM driver of the sound card. This ensures the lowest possible latency, eliminates a number of problems associated with the Windows mixer, and allows easy audio streaming between two souncards. However, the WDM-based approach has some disadvantages, too: 1) the program does not work on the old versions of Windows; 2) the sound card can be opened only at the sampling rates directly supported by the driver, since the program cannot take advantage of sampling rate conversion in K-Mixer. The polyphase FFT algorithm is used to calculate the displayed spectrum. The screenshots below show the difference between the standard FFT and polyphase FFT: the latter has much higher resolution but does not introduce extra spectral leakage. 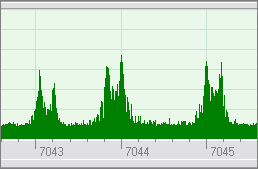 Non-linear filtering is applied to the power spectrum before it is displayed. This improves the signal-to-noise ratio and makes weak signals clearly visible in the noise. The filter is always turned on in the program, but I temporarily disabled it in the code to take the screenshot presented below. Due to this non-linearity, the time constant of the filter is high for the noise but close to zero for the strong signals. While the spectrum display has high resolution in frequency, the waterfall display is designed to have high resolution in time, so that CW signals can be copied visually at the speeds up to 40 WPM. How many callsigns can you read on the screenshot below? Two optional filters are available in the waterfall display mode. The filters can be enabled and disabled using the drop-down menu of the Waterfall Display button. Key-click filter removes CW key clicks. It is implemented as spectral subtraction: the estimate of the power density of the key clicks is subtracted from the power spectrum of the signal. The filter also has some de-noising effect. Super Resolution filter is based on the transform known as time-frequency surface re-parameterization. The method is described in detail in this publication. 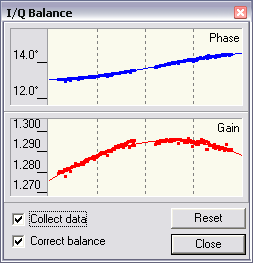 I/Q Balancing in Rocky is fully automatic and does not require any lab equipment, all you have to do is start the program when the band is open. Rocky will use all strong stations on the band as signal generators! The Z value is complex and contains information about the amplitude and phase of the image in respect to the main signal. The program averages Z over the time, calculates the required amplitude and phase correction as a function of frequency, and fits a polynomial to the correction coefficients. The I/Q correction filter is constructed from coefficients and applied to the input signal in the frequency domain. I have an old version of SoftRock40, the one without the mod to the Johnson counter. 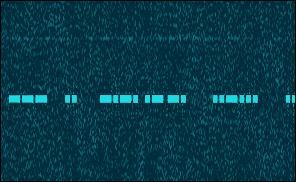 The new versions probably have much smaller errors due to better timing of the LO signal. The main filter is a classical windowed-sinc filter. Since the bandwidth of the filtered signal never exceeds 3 KHz, it makes sense to do filtering at a lower sampling rate: this saves a lot of CPU cycles. The desired segment of the spectrum is mixed down to baseband and re-sampled at 6 KHz, the filter is applied, and the filtered signal is mixed with a complex sinusoid to ensure the desired pitch. Mixing, re-sampling and filtering are performed in the frequency domain. 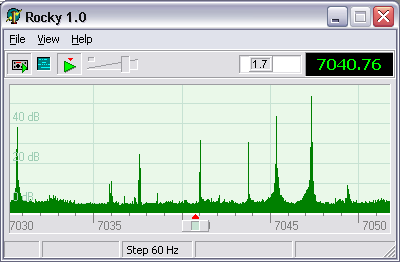 The program tries to open the sound card for output at the 6 KHz sampling rate. If this fails, it up-samples the signal to whatever sampling rate is supported by the sound card. The bandwidth of the main filter is adjustable between 20 Hz and 600 Hz. 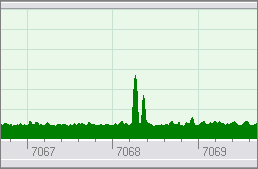 What bandwidth should you use? In the classical, all-hardware CW receivers, the 500 Hz bandwidth is the standard: a narrower filter would make it difficult to find stations on the band and to tune precisely at the signal. This is not a limitation in a software-defined radio: all stations, even the weakest ones, are clearly visible on the spectrum and waterfall displays, and precise tuning at the station can be performed with a single mouse click. Now you can use very narrow filters with ease. 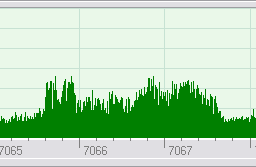 For a CW signal, the optimal bandwidth in terms of SNR in white noise is 1.5 * WPM - e.g., 45 Hz for a 30 WPM. Under heavy QRM, even narrower filters should be used: you will have a bit lower signal-to-noise ratio but much better signal-to-interference ratio. When you start using narrowband filters in Rocky, you will appreciate the Snap function. Tuning at a signal manually with a 20-Hz filter is a nightmare! The shape factor is a ratio of the filter bandwidth at -60dB and -6dB. One might think that the closer the shape factor to 1 the better. Wrong! Filters with very small shape factors inevitably ring - not because of poor design, but due to the Gibbs phenomenon. The only way to eliminate ringing is to increase the shape factor. ShapeFactor = (TransitionBW + Bandwidth + TransitionBW) / Bandwidth. 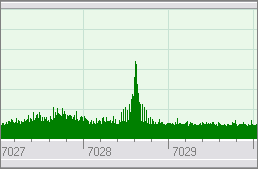 Rocky allows you to select one of several pre-defined transition bandwidths, the choice is presented as a shape factor at the 500 Hz bandwidth. This feature was added only for experimentation. For everyday operation, use the Auto Select option - this tells Rocky to maintain the optimal shape factor at any filter bandwidth. Exercise. Select the filter shape factor of 1.02, disable AGC, and set the 500 Hz bandwidth. 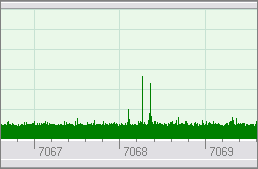 Tune at a strong, high-speed CW signal so that its frequency is close to the filter cutoff frequency. 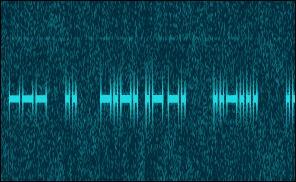 You will hear strong ringing that starts a fraction of a second before the main signal, and gradually fades out after the end of the signal. The AGC algorithm in Rocky maintains the optimal dynamic range of the output signal. This is different form the classical AGC systems that care only about the upper end of the dynamic range. As a result, this AGC has the right gain both during and in between the strong signals and allows the operator to hear weak stations between the dots and dashes of the strong ones. The output signal of the AGC unit is a product of the input signal and the AGC gain as a function of time. In the frequency domain, this is equivalent to the convolution of the input spectrum and the spectrum of the gain function. 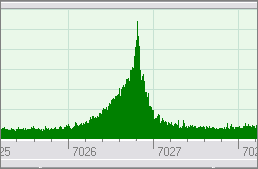 Therefore, AGC adds sidebands to the spectral peaks of the signal - this effect is known as intermodulation. Since the sidebands are just copies of the gain spectrum, intermodulation can be minimized by ensuring that the gain function is as narrowband as possible. This is acheived by lowpass-filtering the gain. The gain filter consists of a sliding minimum filter followed by the Blackman FIR filter. The length of both filters is the same, this ensures that the filtered gain does not exceed the instant gain calculated from the mapping function, and thus clipping never occurs. The S-meter in Rocky is an attempt to see if SDR software can do better than just simulate the behavior of a hardware device. An analog S-meter is usually based on a peak detector with exponential decay. The S-meter in Rocky works differently: it tracks the envelope of the signal using the sliding minimum algorithm, and displays the true signal strength with a 0.3 s resolution in time. As a result, the indicator does not jump at each dot and dash or voice burst, and changes only when the signal strength changes. The variations of instant power under the envelope are shown on the S-meter with white dots around the marker, each dot is 6 dB or 1 S unit. 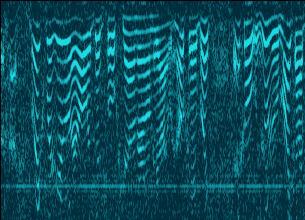 In the SSB mode, you can estimate the peak factor of speech by looking at those dots; for a CW signal the dots show the difference in power between Morse elements and spaces between them (that is, the true SNR). 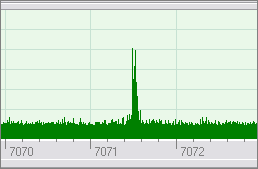 This is a slow, well-shaped CW signal. 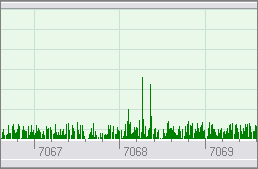 Perhaps you could copy it visually by watching the peak jumping up and down. 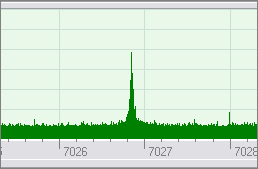 High speed CW. The structure of the keying sidebands is clearly visible. CW with heavy key clicks. Chirping CW: the keyclick sidebands are asymmetric. 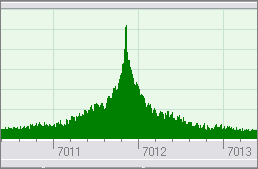 SSB signals can be easily recognized by their 3 KHz bandwidth. 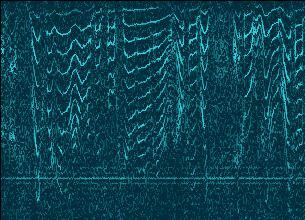 An RTTY signal has two peaks that are 170 Hz apart. Three signals are present in this screenshot. PSK31 is a phase-shift-keyed signal with the baud rate of 31.5 Hz. Its two spectral components are 31.5 Hz apart, which is close to the maximum resolution of the spectral display.